The news that Sam's investment group has talked to former Rhinos head coach Pat Ercoli and that they'll try and find an alternate home for the Rhinos in the event that PAETEC Park is out of the question due to legal battles between the bank and the city has caused quite a stir at Devo's blog. I'm going with the "If you're not with the one you love, love the one you're with" on this one. PAETEC Park should be the home of the Rhinos. 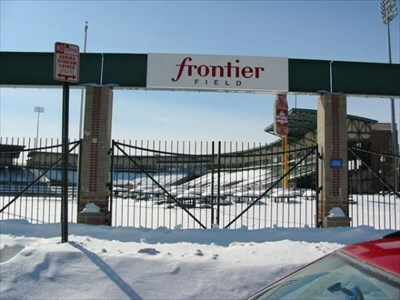 But, if the choice is Frontier Field or another location in town, I'll take that over the team not playing at all in 2008. Certainly a team can survive a year off. The Montreal Impact did it after taking the 1999 season off from the outdoor game. But, teams can also survive at less than ideal venues when drastic measures need to be taken. And if the Rhinos were to play their games at Frontier Field, that should end complaints about the neighborhood and the concessions, right? Let's just hope that the bank folds soon, they call up Dan Williams to talk, and this gets resolved much sooner rather than later. I think everyone involved is getting more and more nervous as time ticks away and there isn't a deal in place. And right now it appears that while the USL has yet to formulate a 2008 schedule without Rochester in it, they do seem to be warming up to the idea of Sam's group running the team in 2008. As always, stay tuned for updates as this thing gets more and more interesting by the day! - Big Apple Soccer.com has a quick recap of yesterday's scrimmage between the Red Bulls and Chivas USA. Scott Palguta was in the starting lineup alongside Carlos Mendes. And with Tighe Dombrowski leaving Red Bulls camp, things appear to be looking good for Scott with regards to sticking with the MLS club. - SBI.net is reporting that the Red Bulls could host Real Madrid at Giants Stadium in August. - Philly.com has an interesting article on the expected economic impact of an MLS stadium in Chester, PA. And speaking of Philly and MLS, Big Apple Soccer.com has an interview with the man running the show there. - In this time of political spin jobs, I give you the spin job being done with regards to Seattle's MLS team playing at Qwest Field. For my money, the only time MLS teams in NFL stadiums work is when a club like Real Madrid is the opponent or it's DC United playing at RFK. - Sam has to be loving Brandi Chastain's upcoming column at Big Apple Soccer.com. - Alen Marcina has signed with Minnesota after spending 2007 with Puerto Rico, Montreal, and Vancouver.